This is something I’ve wanted to talk about for awhile, because I’ve seen some friendships around me fall apart, and seeing how it has effected the ones I care about has made me wonder what others think. It’s been a long time since I’ve felt as though I lost someone’s friendship that really meant a lot to me, but over the last year or two, I’ve seen some of my best friends lose close friends to them, and I’ve lost a close friendship of mine as well. 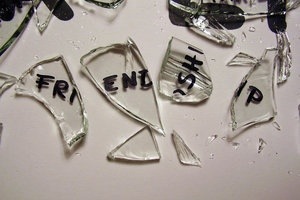 A close friendships that dissolves can be painful. In a conversation I’ve had recently about this, I said losing a close friend feels like a breakup. Isn’t that the truth though? This person hasn’t died, they didn’t move, they probably are still in the same proximity to you as they were when you were close, but all of a sudden, they stop actively taking a part in your life and you in theirs. At 26, I look back in my life and see all of the ‘best friends’ I had and who meant a lot to me all these years, and it’s easy to see that we lose a lot of our close friendships along the way simply because of maturity, different interests, life, etc. These aren’t the friendships I’m talking about. Of course, many of us have friends that we’ve had almost our whole lives, and those are friendships I believe we need to cherish and nurture… But not all of these friendships have lasted until now. At this stage in my life, being in my mid-twenties, I believe that friendships we lose at this point and forward are because of an extreme situation, immaturity or the inability to see eye to eye (or understand) the person you once knew very well who now looks like a stranger. Extreme situations and maturity often go hand-in-hand, because while we all have moments where we wish we would have said/did things differently, as long as the level of maturity and respect is there in the friendship, the relationship you have and want to preserve will always prevail. Hold on to these friends. I have people like this in my life, and I’m more and more thankful for them everyday. Apologies, an open mind and understanding go father than you could ever imagine. The inability to see eye-to-eye with someone you once really cared about, is the hardest one to swallow. This typically stems from the maturity issue or extreme situation that one of you we’re unable to step up to and discuss. This is one that I feel mostly effects me, and makes me upset to look back on, as I’ve always tried to be someone who looks for the best in tough situations, and wants anything more than to resolve issues and move forward. It is hurtful, when the person, or people, on the opposite end cannot, or refuse to do the same. Any friendship worth fighting for needs understanding, openness and maturity. The friendships we lose, where we just don’t understand what happened, are the ones that either deserve another chance, or are the ones you were fortunate to get away from. If in your heart you know you’ve done all you can to salvage a relationship and it still isn’t alive, it’s okay to let it go and move on, for yourself. If you have a past friendship that you think about and wish you had done things differently, regret is the worst form of self-hurt. It’s never too late to make things right.